If you’ve come here in the hope of finding the best bikes for seniors and you have little time on your hands, this short paragraph contains all the information you need. After reading the latest reviews of bikes for seniors and after comparing the quality, affordability, and reliability they offer, we’ve concluded that the model to get is the Schwinn Discover Hybrid. This unit is very sturdy yet still lightweight enough so that it is easy to transport and ride without having to waste a lot of your energy. It comes with 21-speed SRAM grip shifters for fast and easy gear changes and a Shimano rear derailleur. What’s more, this unit is very versatile, and it can handle both on-road and off-road conditions without a hitch. If by an unfortunate event our first pick is not available for sale, but you are still looking for a great gift for grandparents, the Schwinn Gammon is a worthy second alternative. Reliable for many years, this model is renowned for its quality and high performance. It is suitable for commuting, but also for exercise. The SR Suntour suspension fork is designed to absorb shocks providing a comfortable ride. You will be able to climb hills effortlessly and go on off-road adventures, thanks to the 21-speed gear shifts. It is an excellent choice for inexperienced cyclists. This is not a strong model, such as a mountain bike. If you are looking for something similar to that, you should check out other products. The bike will offer your grandparents a comfortable ride. If you want to provide your senior family members with a ride that will inspire them with confidence, this is an excellent choice. It is an affordable and a high-quality option for seniors. The bicycle is equipped with a steel cruiser frame and fork which are designed to create a smooth and relaxing ride. The simple single-speed drivetrain, combined with the intuitive coaster brake provides the rider with extra-safety. The bike has to be assembled when it arrives, and it requires multiple types of wrenches to put it together, which might be a complicated process. An affordable and high-quality bike for any senior. This is one of the most comfortable bicycles in its price range. It is an excellent choice for any senior who wants a cozy ride. The model comes with the Raleigh True comfort geometry offering its rider an upright, but also laid back position, which helps avoid back pains or any uncomfortable body positions. The bike is also equipped with large tires that will help roll over bumps like it's nothing. The only customer complaint about this item is that the assembly instructions are not very clear. Still, the process itself is not so complicated. A great, comfortable, and safe ride for your senior relative. To make finding the best bikes for the elderly much more straightforward, we have compiled a list of the top-rated models currently available for purchase. These are the options that have garnered some of the best senior bikes reviews, and they are well-worth considering if you are in a hurry and you can’t afford to prospect the market thoroughly. The Schwinn Discover Hybrid is patented and renowned for the quality and performance it will offer over the years. It is an excellent bike choice for commuting around and for exercise. The feature this unit has that is unlike of that of any other bike in this price range comes from the well-designed SR Suntour suspension fork that will absorb shocks to create a smooth ride. The 21-speed gear shifts will allow for easy hill climbing, and it will come in handy if the person you get this option for plans to go for off-road adventures. The SRAM grip shifters will enable the user to change the gears quickly and easily. It is a type of gear system that is recommended for new and inexperienced cyclists. While not as strong as a mountain bike, this model can cope with rough trails without a problem. With this option, your grandpa can leave his favorite travel wheelchair at home and enjoy a short and enjoyable ride on his new bike. If you are looking for an affordable and high-quality choice for your senior relatives to use, the Schwinn Gammon is a bike that is built to infuse confidence into the person that rides it. 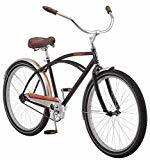 It comes with a steel cruiser frame and fork that will create a relaxing and smooth ride in a vintage cruiser look that is bound to stir a few memories. The simple single-speed drivetrain combined with the intuitive coaster brake will allow for a carefree ride that even your grandma will enjoy. The swept back cruiser handlebars will keep the body upright for a ride that is very comfortable and easy on the back. Exercising on this bike will go hand in hand with the most efficient osteoporosis treatments. The front and rear fenders are not there only to add a retro style to the bike, but also to protect your grandpa’s T-shirt and pants from the dirty and unpleasant weather. Why the Raleigh Venture, you’re wondering? For starters, it is one of the most comfortable bikes in its price range, and whether you are cruising the boardwalk or the bike path, this option is built for smooth riding. The increased comfort that it offers makes it ideal for use by a senior that wants a bike that is just as cozy as their favorite power wheelchair. Of course, the person needs to be able to cycle. The bicycle features the Raleigh True comfort geometry that puts the rider in an upright, yet laid back position to avoid back pains or any uncomfortable body orientations. The comfort factor does not stop here; the unit also features a smooth riding frame, adjustable stem, suspension fork, seat and grips, and big and large tires to help roll over bumps with ease. The pedals also have a no-slip grip, and the bars feature classy graphics and reflective details that add a refined look to the bike. With 7 gears to choose from you will be able to ride up and down the road very smoothly. If you feel confident about assembling your bike, the Diamondback alternative is an excellent choice for a grandma gift. This cruiser is sturdy and heavy compared to the other options on our list but not too heavy that you can’t walk it effortlessly down the sidewalk. Despite the heavy and sturdy design, the bike is super-comfortable. The product will arrive approximately 85% assembled and will require a fair bit of installation and adjustments of the components and parts. Customers have reported that the installation guide is reasonably easy to follow, but even if you don’t feel up for the task, you can bring it to a capable bike shop to be built. The placement of the handlebars can be adjusted so that they meet the riding style of the rider. The pedals are also a bit more forward from the seat, and that will make pedaling easier. Once you start riding this bike, you won’t want to stop. If budget is not a problem for you and you are looking for a bike that will make your grandma want to use her bike and wheelchair gloves and start to exercise, the Sixthreezero option will please both of you. The 7-speed comfort bike is ideal for recreational and light exercise purposes, and it is great for relaxed riding with enough gears to tackle light hills. The quality front suspension will help reduce vibration and shock on bumpy terrain while the reliable Shimano gearing will allow for speeds of up to 25 miles per hour. The frame geometry is also designed to absorb shocks and take tension off the major joints. This will help ease pain during and after rides. The cruiser configuration will allow for a smooth and easy paddling while the 2-inch slick tires will make it easier to go over obstacles and enjoy a cushioned ride. As a plus, you get a rear rack where you can add optional panniers and accessories. Finding good bikes for seniors is not an easy task, not when you consider that there are so many options available for you to choose that settling for just one may seem daunting. Still, that’s not a reason to give up since cycling is a fun and easy way to make your grandparents get off their favorite tablet for seniors. If you are short on time but you are still resolute about finding the best bicycles for seniors, we have a solution for you. To spare you the unpleasant task of researching the web, we have gathered all the useful information in our straightforward buyer’s guide. Take a look below if you want to learn more. The first step when looking to purchase this kind of product is to choose a bike that is a good fit for the type of riding that you or the person that you intend to buy this option for will usually do. That means that for example, if the person wants to use the bike mostly in the city, getting a mountain bike might not be the best idea. City or commuter bikes generally come with accessories such as a rack, lights, and mudguards. They are the go-to choice if you are looking for cheap senior bikes since they are a very wallet-friendly option. For off-road cycling, you might have to wring extra cash, but it is doubtful for a senior to adventure on rugged roads. Of course, if you are not sure about how the bike is going to be used, or if the person intends to take the bicycle on-road and off-road, you can consider getting a unit that can tackle both environments. This option can be a bit more expensive, but the versatility that you get from it is well worth the money. For people that are new to cycling or that haven’t cycled in a long time, an upright bike style is recommended. This style is much more comfortable and will give the rider more awareness on the road, and that makes it ideal for older riders. Choosing the right style is not everything when it comes to getting a bike that will make the rider feel comfortable and ready to exercise. The correct frame size is another essential factor that needs to be considered carefully. You should look for a model where most of the weight is carried by your feet, and not the bottom or your hands. The height of most bikes is measured based on the seat tube length. For a good fit, you should ensure that you can stand over the bike with some clearance. The best saddle height is also easy to find; you need to make sure that when you place your heel on the pedal, and the pedal is at the bottom of the stroke, your legs are straight. Another important feature is the length of the top tube since it determines how far you will have to stretch while riding and for seniors, in particular, pulling the back too much might cause discomfort. There are no guidelines here, but comfort is paramount. The material that the frame of the bike is made of can impact your ride. Currently, you will have to choose between three options, and the one to get depends on what you want to focus on. Steel is a common material on classic bikes, it is very strong, and it can absorb bumps. The downside is that it rusts easily, and can be quite cumbersome to move. Aluminum is a common material for city-style bikes, it is much lighter than steel and it does not rust. The main disadvantage is that it does not do as well as the other two at absorbing bumps. Carbon fiber is generally present on off-road bikes, it is very light and can absorb bumps, but it can be costly to get. Concerning gears, many modern alternatives come with 27, but that is much more than a senior will ever need. In the city, five to eight speeds offer enough performance. More gears may be useful if you are riding in a hilly area. There is no need to get an option with more gears than you will ever use since they cost more, add weight to the bike, and can increase maintenance issues.